Note: A publishing glitch held up last week’s newsletter until Monday, July 17. Sorry for the inconvenience. I surely ate well last week, considering I didn’t cook a shred of food. Nothing. Nada. Some of the blame goes to my shoulder (I tore the rotator cuff in a fall and now need a shoulder replacement). But mostly, I couldn’t resist all the barbecue, hot chicken, biscuits and Coney dogs flung in my path. Tony thinks we went to Asheville, N.C. to see the Smoky Mountains and drive the Blue Ridge Parkway. The real reason, of course, was the food. With the exception of New Orleans, North Carolina is probably my favorite food region in the United States. Western North Carolina, where we went, is even better than my usual haunts along the coast because a bit of Tennessee cuisine bleeds across the border, giving us the best of two states. Yes, I’m talking about hot chicken. We couldn’t believe our luck when we spotted Rocky’s Hot Chicken Shack just a couple of miles from our campground on the western edge of Asheville. Tony made a U-turn, parked, and we queued up at the ordering window. Yup, this is the stuff, we agreed as a tray of meals sailed past. The cayenne-red fried chicken was crunchy-crisp, spicy hot and faintly honey-sweet. I think it was even better than the hot chicken we had in Memphis a couple of years ago. It was so good we ate there twice in five days. The biscuits were world-class, too. We would have eaten at Rocky’s more often but we had barbecue to find and hush puppies to snarf down. We did both at Hawg Wild Bar-B-Que in Pisgah Forest, N.C. We had to really hunt for a good barbecue place. Barbecue doesn’t seem to be as plentiful in the western part of the state as in the east. Also, restaurants make a big deal of the difference between the regional styles. All of the good stuff is whole-hog, naturally, but western style comes with ketchup-based sauce while eastern style has vinegar-based sauce. Hawg Wild’s barbecue was so smoky and juicy I couldn’t see covering up the flavor with red sauce. I had eastern style along with creamy coleslaw and a clutch of hush puppies. I ate hush puppies everywhere I could, from the Hot Dog King (great Coney dogs packed with relish) to the barbecue place. I love those little cornbread nuggets, especially when they are laced with jalapeños as they were at the Hot Dog King. 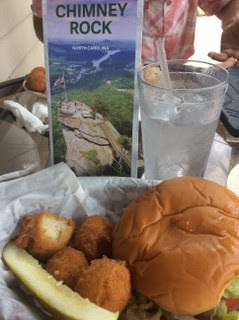 The one place I didn’t get hush puppies and didn’t miss them was Rhubarb, an upscale Asheville restaurant helmed by chef John Fleer, a multiple James Beard nominee for best chef in the Southeast. Fleer executes his modern Southern menu perfectly, and I don’t say that lightly.It was the best meal I’ve had in a very long time. Six components, all stellar, went into my entree of duck confit over Swiss chard. Tucked under the two duck legs and thigh was also a palm-sized sweet potatoes Anna (thin sliced, formed into a cake) infused with so much umami flavor it had to have been roasted in duck fat. Scattered over everything was “wet” walnuts that tasted of Bourbon but somehow remained crisp, and tiny sprinkles of sweet marinated garlic. A wide swath of rhubarb sauce streaked one side of the plate. Most diners the evening we visited chose to sit outside on the covered patio overlooking Pack Square. I’m glad Tony and I opted for the dining room, a high-ceilinged space that looked like a rubber shop mid-rehab. The plaster walls were gouged and spotted with bits of old paint. Big industrial-looking lights dangled from the ceiling. We sat near the open kitchen, with a good view of the two brick ovens. I’m sorry I couldn’t get Fleer’s recipe for sweet potatoes Anna, but you can bet I’ll be working on it here at home. Meanwhile, here’s a recipe for jalapeño hush puppies, humble but just as Southern and almost as delicious. Combine the flour, cornmeal, baking powder, baking soda, sugar, salt and onion in a large bowl. In a smaller bowl, whisk together the milk, eggs and vinegar. With a wooden spoon, stir the wet ingredients into the dry ingredients just until combined. Stir in the jalapeños. Do not over mix. Heat at least 2 inches of oil to 375 degrees in a wide, deep pot or deep fryer. Drop tablespoons of the batter into the hot oil. Do not crowd. Fry for about 5 minutes or until golden brown. Break open the first couple of hush puppies to check for doneness. Transfer with a slotted spoon to paper towels. Salt if desired. Continue until all of the batter has been used. Makes about 6 to 8 servings. At Graf Growers on White Pond Drive in Akron, “local” this year will actually be a farm about 45 minutes south of Akron, according to Karlie Graf, marketing manager. Graf’s fields were too wet for planting this spring, so the Grafs contracted with another farm to grow corn using Graf seeds and techniques, such as hydrocooling the picked corn. Daily shipments should begin July 18, Karlie says. Wherever you buy your corn, call first to avoid a disappointment. What I ate in restaurants last week: Southwest avocado-tortilla-lime salad at Panera; cheeseburger Happy Meal at McDonald’s; oysters with country ham and cornbread stuffing, confit of duck with rhubarb sauce at Rhubarb in Asheville, N.C.; hot chicken thigh, collard greens, biscuit, corn pudding at Rocky’s Hot Chicken Shack in Asheville, N.C.; Coney dog with relish, hush puppies at the Hot Dog King in Candler, N.C.; country ham sandwich and sliced tomatoes at Genny’s Family Restaurant in Chimney Rock, N.C.; more hot chicken; and chopped pork barbecue, coleslaw and hush puppies at Hawg Wild Bar-B-Que in Pisgah Forest, N.C.
Did you know Joe’s Home Cooking at its Finest — new location on Cleveland Avenue near Route 618 and Beiler’s Market in Uniontown— is back and open again? Great food and prices with larger eating area and lots of parking at the new location. Dear Kathy: Thanks. I know a lot of people liked that place. I finally get to give it a try. Rim glasses with lime juice, coarse salt and chili powder (ancho is nice). In a blender mix 2 cups ice, 4 ounces tequila, 2 ounces orange liqueur, 1 ounce lime juice, 3 sprigs of cilantro (optional), 1 avocado, diced, and 2 tsp. agave nectar (although I prefer 1 tablespoon honey). Blend until smooth. Pour into glasses and garnish with lime wedges. Re: slugs on basil — To get rid of your slugs, save your egg shells and after drying out for at least 2 hours, crush them and spread them around the plants the slugs are eating. It is organic and I know it works. We had hostas that were being eaten by slugs and after putting crushed egg shells around the plants the eating stopped! Dear Diane: Thanks for sharing. Sounds easy and convenient. Re: smoked salmon hash — When my friends Don and Linda Murfin were officers of the Akron City Club in the early 1990s, a chef there created “Murfin Hash” for them. I use a lightly poached egg per serving as the liaison rather than the Boursin-based cream sauce created by the chef, but I love the chef’s innovation of chopped fennel bulb and beets (triple rinsed; added just before serving) to the familiar mixture of cubed browned potatoes with onion and similar sized pieces of smoked salmon. Dear Mark: Aha! A fine use for the beets growing in my garden. Thanks. I saw that you had eaten smoked salmon hash last weekend. I have an easy cheat to make it at home: I use Ore Ida potatoes O’Brien which already includes the chopped peppers and onion You can add more veggies or some dill if you wish. Brown the potatoes in butter. Stir in a bit of half and half to add just a bit of richness. Then flake in 4 to 6 ounces of smoked salmon. Leave it in small pieces, not shreds. This can be topped with a runny sunny-side-up egg for extra richness. I serve this with a homemade horseradish sauce that I use lots of horseradish in. A easy cheat for salmon chowder is to use the baked potato soup from Sam’s Club or Costco. I brown some extra onion in butter, add smoked salmon for just a couple of minutes, then stir it all into the warmed soup, Lovely with a salad on on a cold winter night. I know you are a from-scratch cook but once in a while it is nice to simply have things on hand that go together quickly on busy days. Dear Jan: I don’t mind cheating with good-quality ingredients and recipes that make sense. Thanks for the good ideas. Please note: If your email address changes, you must re-subscribe to my newsletter in order to continue receiving it. We are unable to change the address for you in our email list. The procedure is easy. Just click on the “unsubscribe” link at the bottom of a newsletter. Then click here to sign upunder your new address. Thank you.